But for a last minute turn just past Pojoaque I’d have missed this beauty. We’d attended Peggy's opening in the Miniatures and More show at the Albuquerque Museum of Art on Saturday night, had dinner at Arroyo Vino with Nancy and Hiroshi Murata and spent the night at their magnificent digs just west of Santa Fe. Then Sunday morning we made a mid-morning push back to Taos. While Peggy beelined it back home I took the High Road through Chimayo and Truchas. 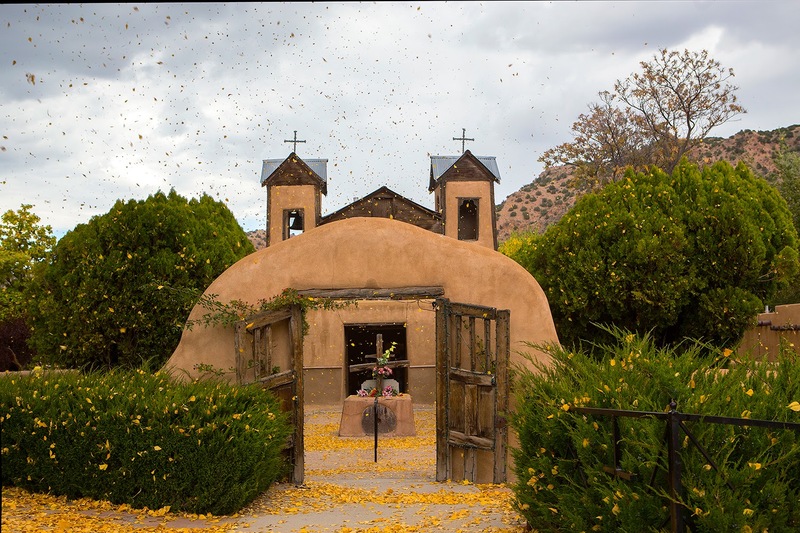 I pulled into the parking lot at historic Santuario de Chimayo in a light drizzle and skulked around the property for some what the heck I’m here shots. None were remotely inspired till, as I was walking back to the car, the clouds burst and the wind gusted out of the east. Yellow leaves flecked the sky and laid a carpet of gold leading to the gingerbread church. Half an hour earlier I’d have missed the show and half an hour later the trees would have been stripped bare. Lends credence to the axiom that you’ve got to be there to get the shot and that being there at precisely the right moment is pure damn luck. This one needs to be seen full size so click on the link in your email and go to the full flown blog. Thank you, Susan. Glad you liked that magic moment. How did you chance upon my blog? Pure damn luck plus a damn good eye! You've put a smile on my face with this one, Steve. As Susan said, this is pure magic. I would have put a couple of other expressions in front of it for emphasis, but you already know my penchant for expletives! Your most excellent image is a definite keeper. Perhaps the poster for next year's Taos Fall Arts Festival?? ?